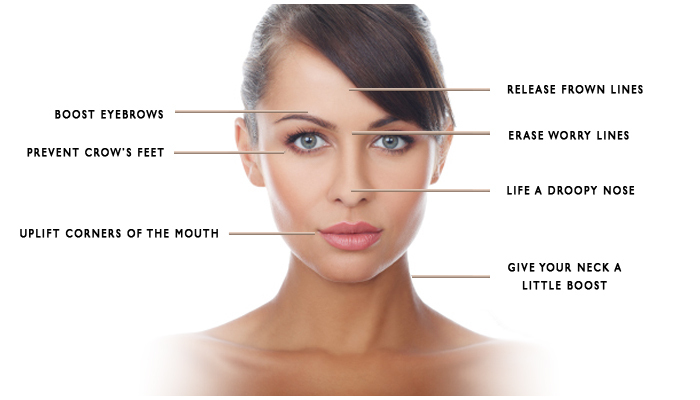 The image above illustrates the many ways in which Botox can enhance and correct your look. Wondering if you’re ready for the pricks? Any cosmetic dermatologist will tell you that when you see wrinkles at rest (usually by age 40), it’s prime time for Botox. But many women in their late twenties and thirties are doing it too. We know you have lots of questions (because we had them too!) so we dug into our interview files with dermatologists and skincare experts and compiled this Q & A so you can make an informed decision. And feel good about it! A. It has been used for wrinkle therapy for over 20 years and has a long and well-established safety history. While you may primarily associate Botox as a wrinkle smoother, it has actually been in use for over 18 years for the effective treatment of a range of medical conditions, including reducing MS-related stiffness (multiple sclerosis) and been used in ophthalmology for over 30 years. It is currently being studied to help with diabetes and menopausal brain fog. Q. WHAT EXACTLY IS IT? A. Botox is a purified protein toxin produced by bacteria, used in extremely small amounts for cosmetic use. Q. SO IF I GET BOTOX ON MY FOREHEAD, WILL IT LEAK INTO MY BRAIN? A. In the amounts used for wrinkle therapy, side effects are temporary and localized to the area of injection, so it does not spread throughout the body and there have been no reported side effects of botulism (food poisoning) from the use of Botox. A. Botox is prepared as a liquid and injected using a tiny needle into the muscle that creates a wrinkle. It then blocks the nerve impulse from reaching the affected muscle and the muscle then weakens. When this happens the skin overlying the muscle relaxes and the wrinkles in the skin gradually soften and often disappear. Q. WHAT DOES IT FEELS LIKE? A. There is an initial minor sting for a few seconds but after that there usually no discomfort. Q. HOW WILL I LOOK RIGHT AFTER? A. There will be some mild redness, which lasts less than an hour. Rarely, there can be a slight headache or some minor bruising and swelling. Most people return to regular activity immediately. A. The onset of Botox is 3 – 10 days after treatment. The effects of Botox usually last three to five months, at which time another injection is required. Q. SERIOUSLY, WILL I LOOK LIKE NICOLE KIDMAN? A. Botox is intended to enhance the way you look, not change it. The loss of facial expression is one of the biggest misconceptions of Botox. When used responsibly and administered properly – in the hands of an experienced physician or registered nurse – you can achieve a natural refreshed look and still be able to smile and frown. Often when you see someone who looks “frozen” it is a combination of Botox and dermal fillers. Fillers perform a different function than Botox, as they increase volume in or below the skin, whereas Botox relaxes the muscle that causes the wrinkle. Q. WHY ARE MORE AND MORE WOMEN IN THEIR 20s GETTING BOTOX? A. For most people in their 20’s the decision to get Botox would either be because they wanted to enhance their appearance – to relax muscles in their forehead and so they can arch their eyebrows, if they like that look – or because they want to keep their skin looking the way it does. The second thing is just the issue of prevention, because the earlier you start getting Botox the less wrinkling you’ll get later in life. The older you get, the more you’re doing it just to treat those wrinkles, the younger you are, the more you’re doing to prevent them from occuring. Q. WHAT OTHER CONCERNS CAN BOTOX TREAT? 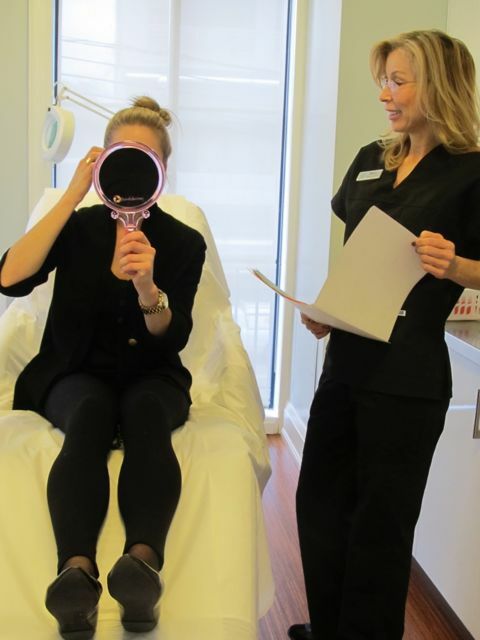 Cosmetic Nurse Diana Phillips at DLK on Avenue consulting with a young woman in her thirties. A. First it’s important to note that all of the main injectables and fillers available (Botox, Restylane, etc.) are Health Canada-approved to treat specific concerns, but many dermatologists and plastic surgeons inject these products off-label to remedy other signs of aging. Off-label use typically doesn’t pose any risks, as long as a board-certified, skilled, qualified expert injector, who is familiar with injectables and facial anatomy is performing your injections (safest bet is to seek a registered nurse, cosmetic dermatologist, or a plastic surgeon). Redefine the jawline by rebalancing the underlying muscles and provide a lifting in the neck and jaw area. Procedure is called the ‘Nefertiti lift’ named after the exquisite bone structure of Egyptian Queen Nefertiti. See pics before and after pics here. Minimizing the look of a square jaw line. Called masseteric hypertrophy, this condition is prevalent in the Asian community. It is also common in people who grind their teeth at night. Dramatic before and after pic here. A. The cost varies depending on the amount of product needed to achieve optimal results and the areas of the face that are being treated. For example, it can cost $300 to $500 to treat the frown lines between the eyebrows, but since the dramatic effects can last up to four months, the cost works out to about $3 – $5 per day. 92 queries in 1.268 seconds.